I'm fairly conservative on fashion trends, so I tend to stick to neutral tones for makeup. However, a few years ago I came across this online article from Glamour regarding a shade of red lipstick that supposedly "looks good on everyone." "A likely story," I thought. But go ahead and click out on that article! There's a picture with a bunch of interns, all looking different and wearing the lipstick. The blonde convinced me I should try it. The color is Nars Heatwave. It's a semi-matte, but I find it creamy and not drying. A very close drugstore match is Revlon Super Lustrous Fire and Ice. It's got more moisture to it, and it's a great, less expensive option. I have both and like them equally. When I'm wearing an all black outfit, I tend to add this lip color to give it a little something extra, otherwise I feel a little dull. Who wants to feel like that? No one! I especially love it contrasted with a navy outfit. Even though it'll continue to be summer for the next 3 months here in Texas, everyone's shifting into fall, so it's a great time to change it up a bit. 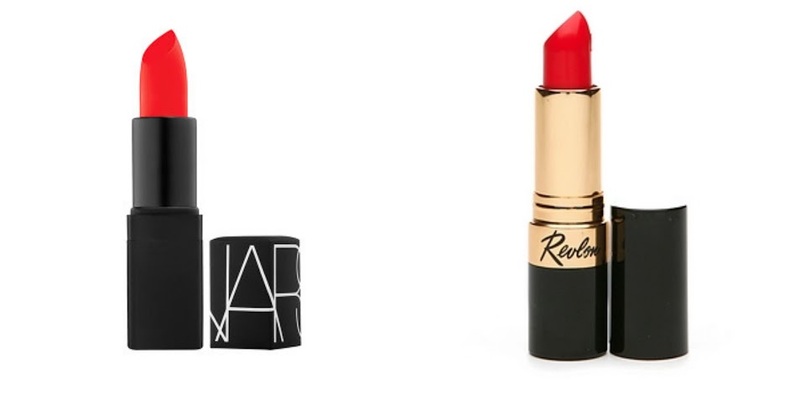 Have some fun with red-orange lipstick!